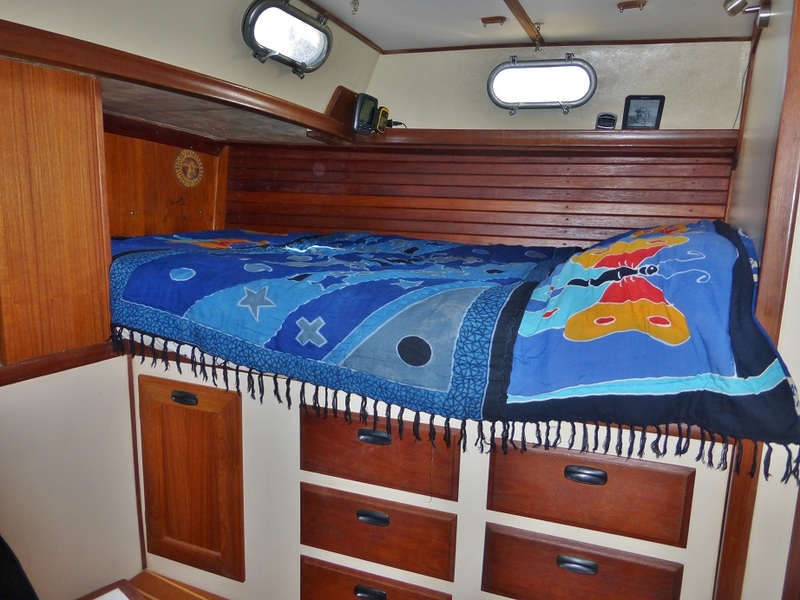 Master Berth with crazy-good custom foam mattress. Master Head with 20G holding tank and shower. 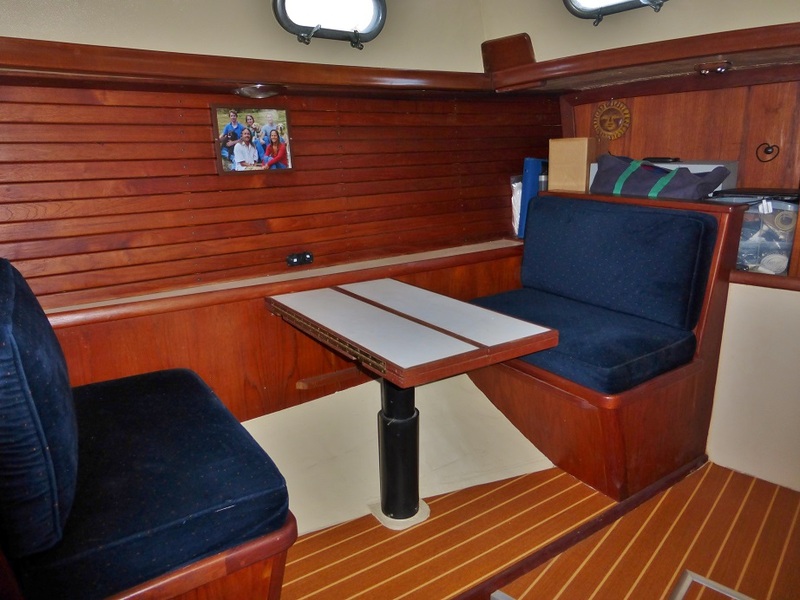 Intimate dinette/office in master with expandable table, converts to Sea Berth. 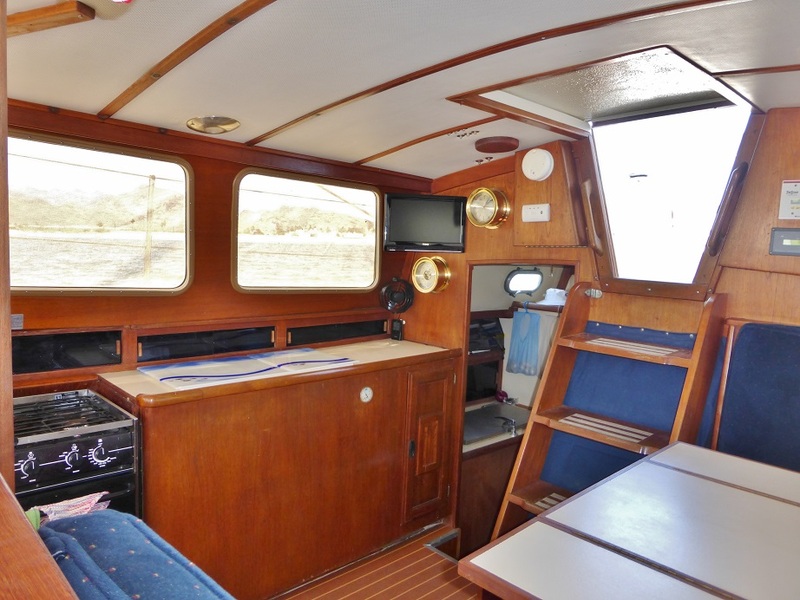 View forward from aft cabin showing companionway outboard of engine room. 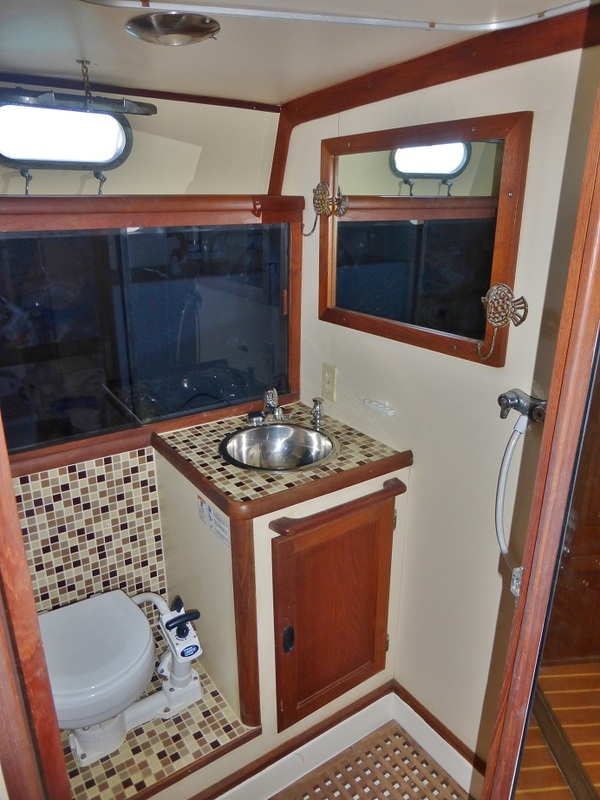 Some boats have a salon. 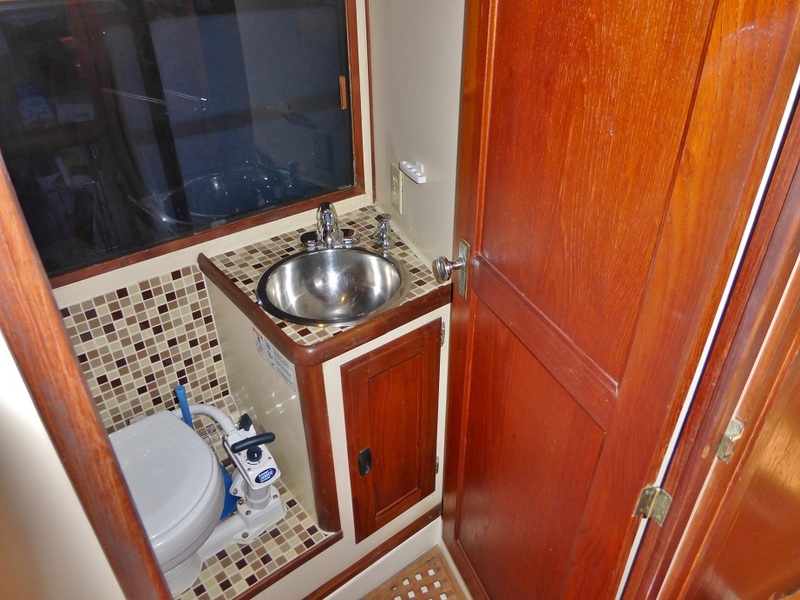 We have a saloon. Salons are where women get their hair done. 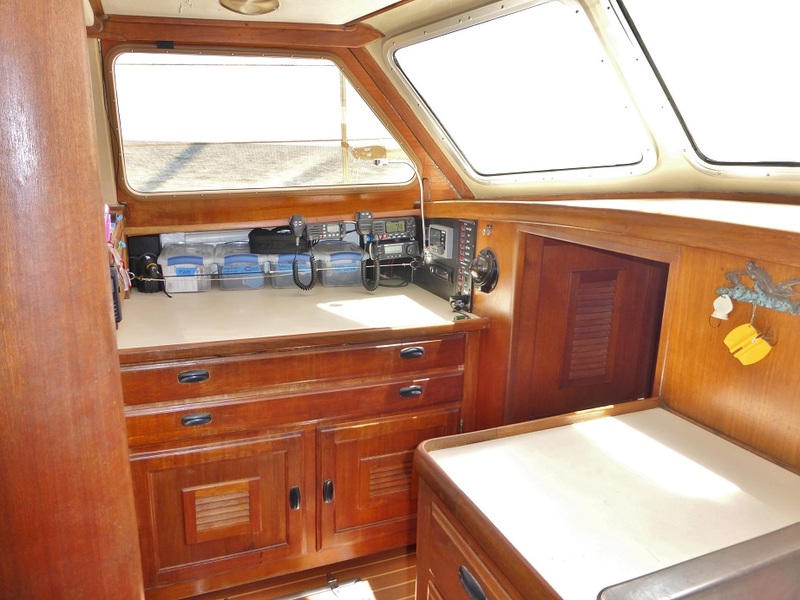 View aft and starboard, showing companionway to aft cabin and ladder to cockpit. 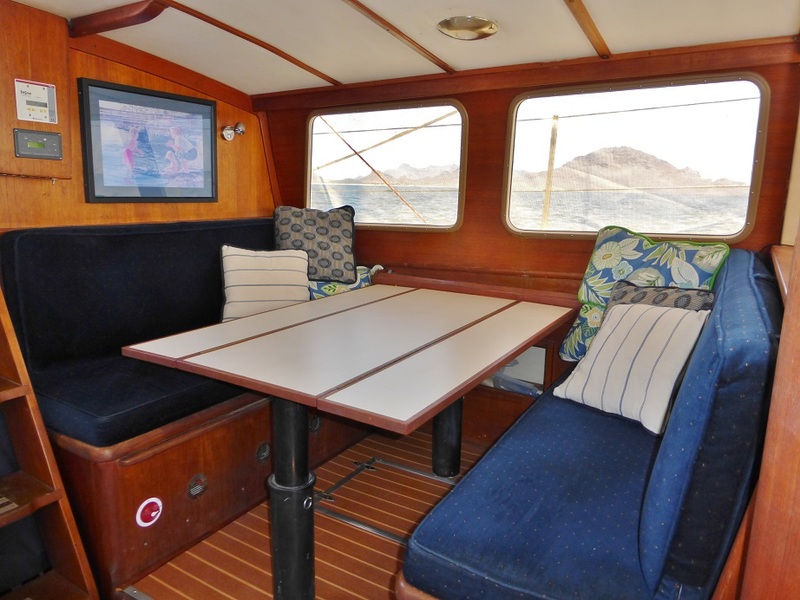 Dinette to port, converts to large lounge area for passages or sleeping for overflow guests. Plenty of storage under floor. 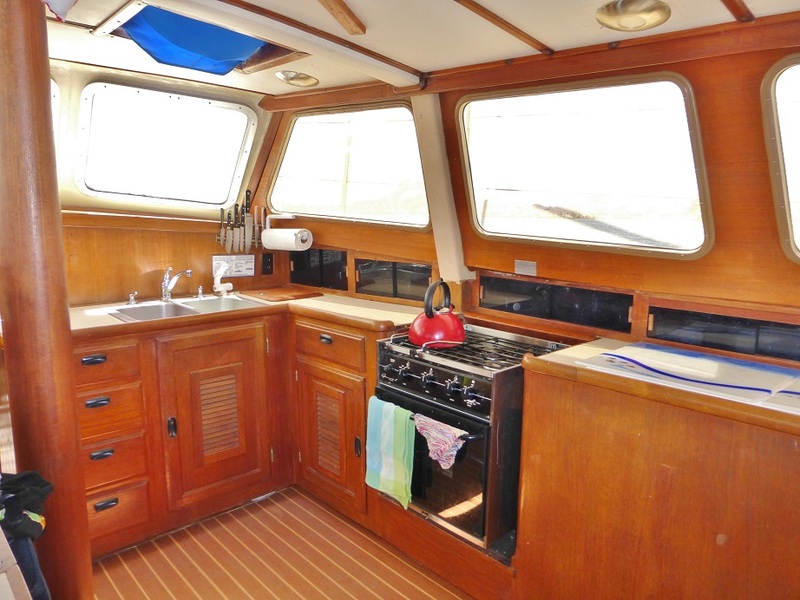 Extremely capable Galley to starboard. 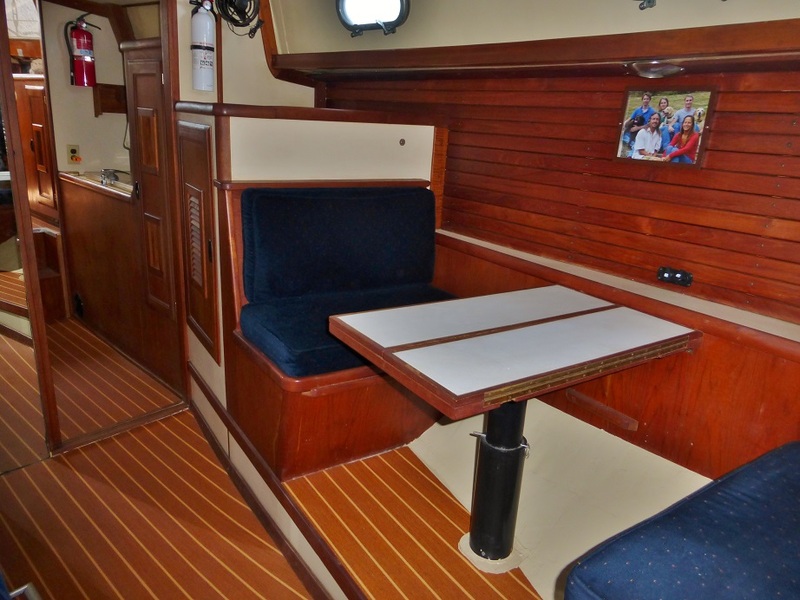 Nav table forward of dinette. Radios, AIS, Stereo, Autopilot (remote in cockpit), Nav. Lights, Storage. Cellar access at floor. Large, powerful 12VDC refrigerator/freezer with slumped art-glass lids. Forward head with 20 Gallon holding tank. 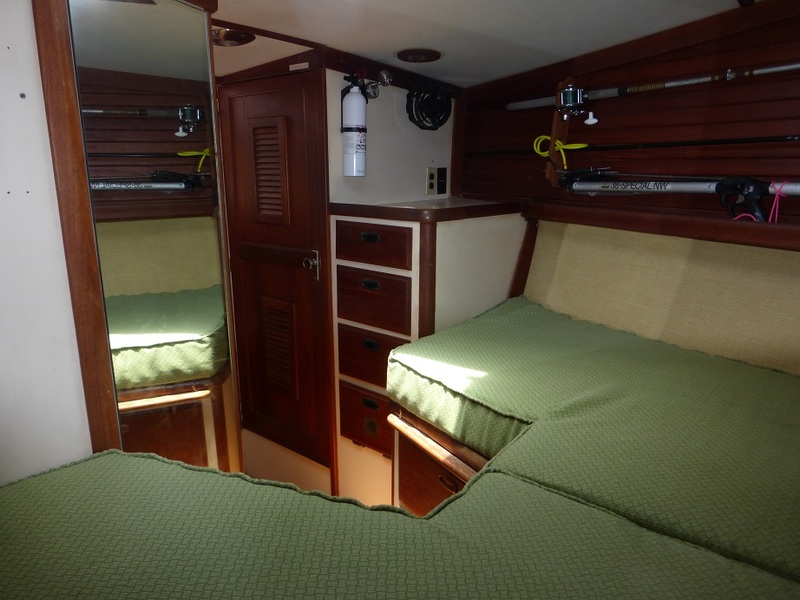 V-Berth looking aft, showing custom mattresses (filler is on-board) and lots of guest storage. 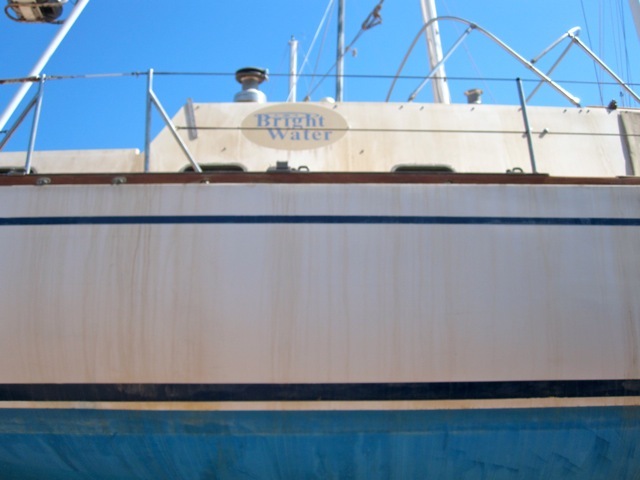 V-Berth looking forward, showing anchor locker. 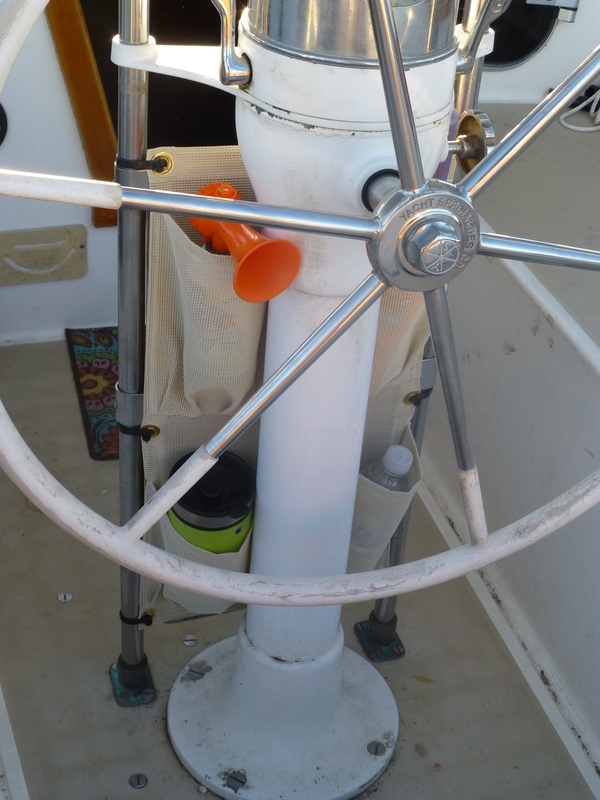 Our lifelines (that give us something to grab onto as we pitch over the side of the boat) are/were the original vinyl-covered stainless steel wire. 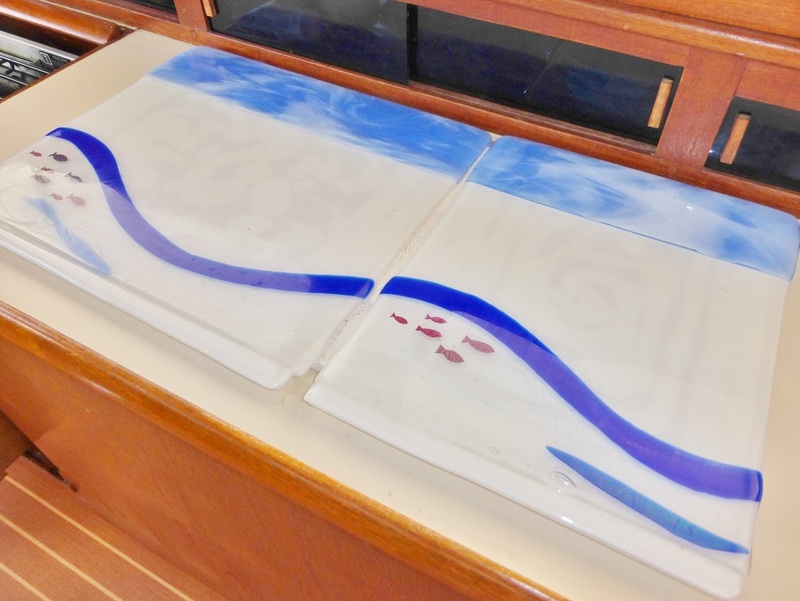 This was a state-of-the-art use of plastics forty years ago but the method is now widely discredited because the vinyl coating hides potentially disastrous corrosion. The conservative solution to this problem is to replace the vinyl-coated wire with new bare stainless. This is simple, pretty fast, and expensive. 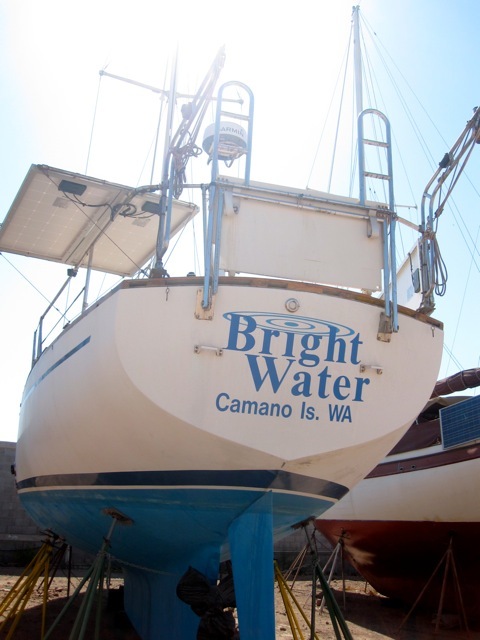 On Bright Water we’re using the newest state-of-the-art plastics to replace our old lifelines. If you take high-molecular-weight polyethylene and stretch it, you create a material that’s stronger than steel by weight. Spider-wire fishing line and plastic grocery bags are examples of this technology. 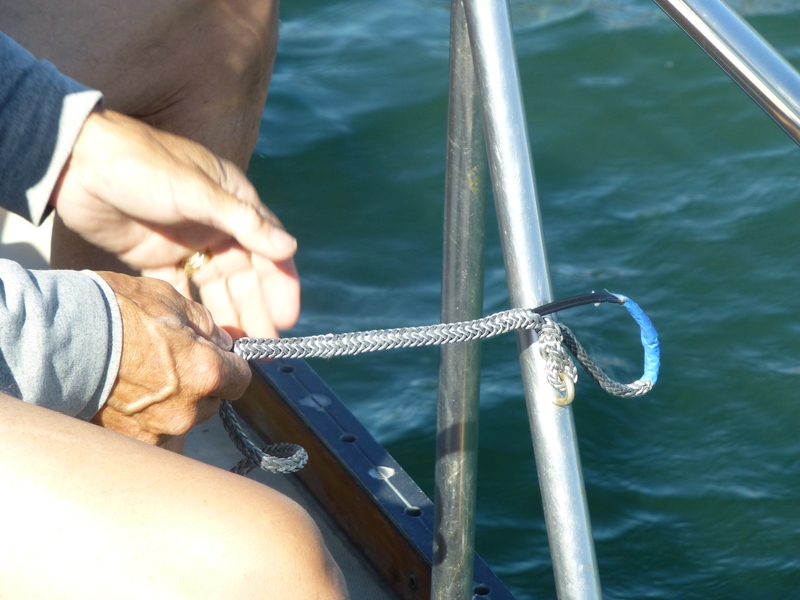 Sailboaters, being all about the tech, have created amazing ropes that are soft and flexible and stunningly strong. 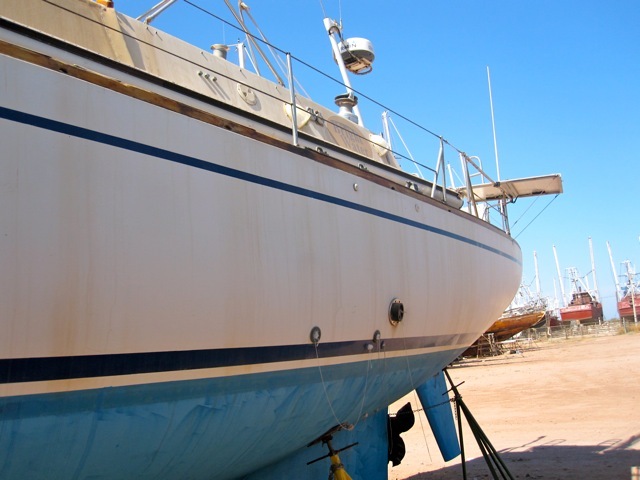 UV resistance is the remaining problem, but new coatings have apparently fixed that problem. The last issue is that the ropes are very, very slippery and knots are tough to…ummm, knotify. So, the locking Brummel splice was invented. One Youtube video later and Bright Water has new lifelines. Woot. Since polyethylene is created in a direct conversion from natural gas, these ropes are also carbon sequestering. The more rope I use the less natural gas is available for burning by people that hate the planet. I’m all about the green. We’ve spilled a lot of coffee in the Bright Water cockpit because cup holders had not been invented in 1974. So we set up the sewing machine in the cockpit, running off the solar-charged batteries through an inverter. 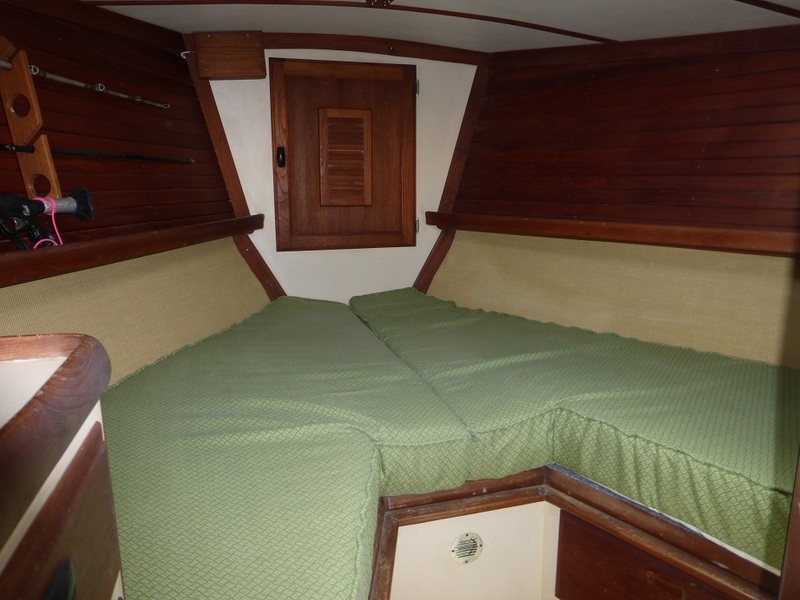 Let me repeat: we used the solar sewing machine in the cockpit of the sailboat. Cool. Nancy whipped up a four-pocket binnacle organizer. 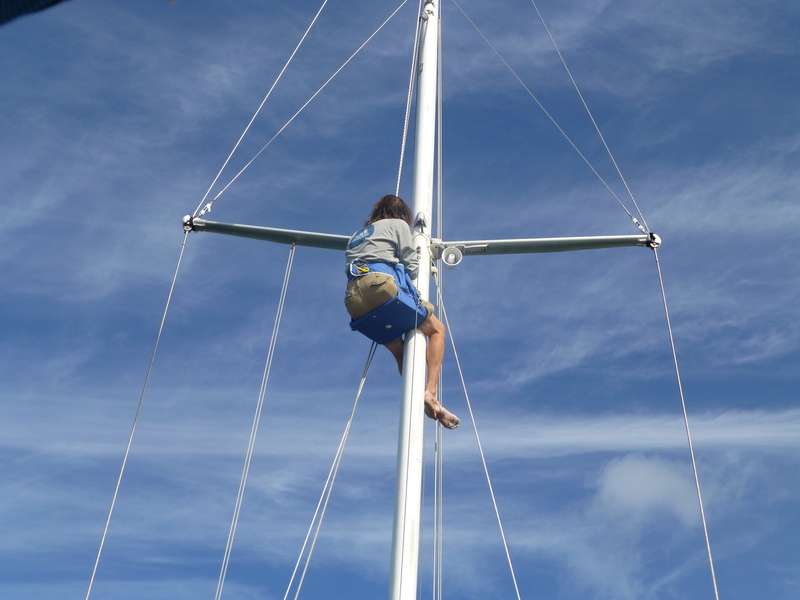 Finally, a little trip up the mast to the spreaders. I’ve been dreading this job for a while, but I managed to drill some holes, install some pop rivets, crimp some connectors, and use a lighter to shrink some tubing without causing injury or significant damage. 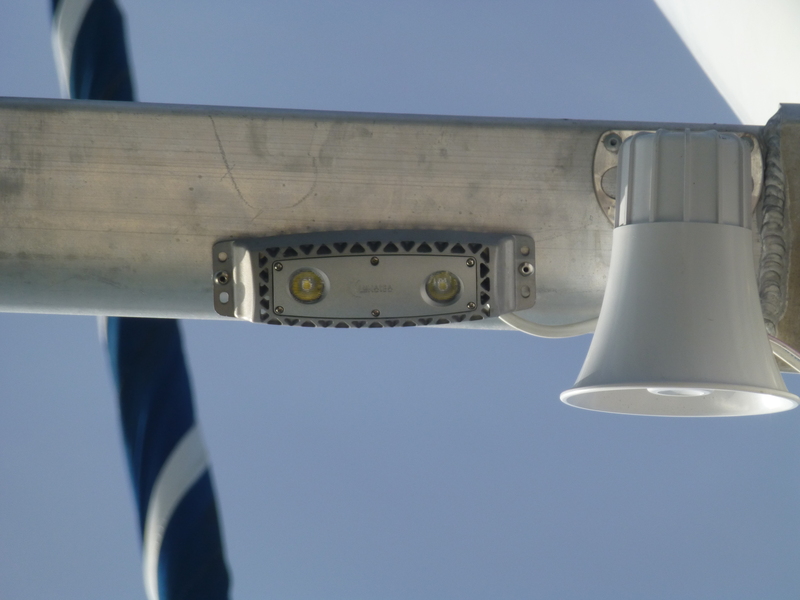 Each LunaSea spreader light has two LED’s that are lensed to create a fore-and-aft light pattern. 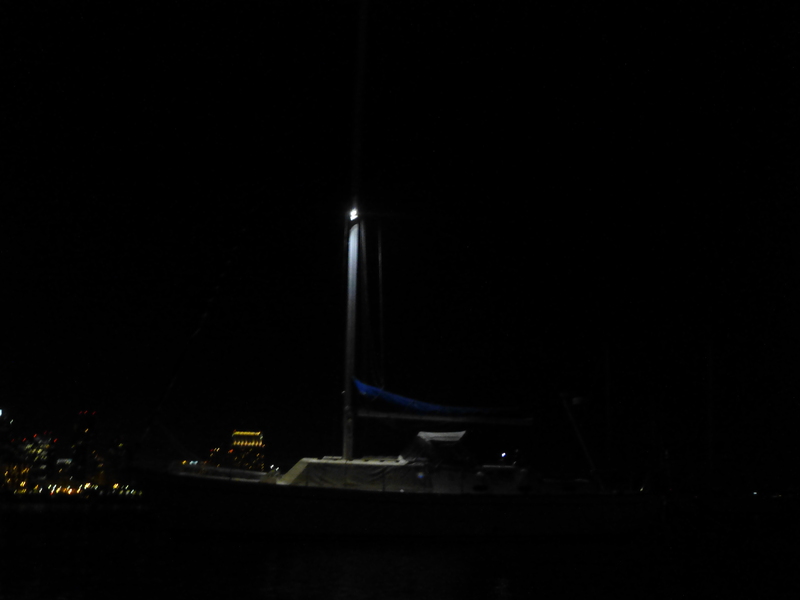 I skewed them a little so the port light shines forward-ish and the starboard light shines aft-ish. Two little lights, drawing almost no power, light up the entire deck with even, white light. Brilliant!